“As an IAM National Observer and RoDAR Advanced Tutor, Ultimate Driving Craft 3 helped me tremendously, to take on board the serious aspects and principles of advanced driving. This double DVD produced by Chris Gilbert will enable any driver to see the prime exampe of excellent driving techniques that are reproduced to a high quality accompanied by excellent graphics and animation. The ‘Timing of Appointments’, in my opinion, is superb and to actually be able to watch Chris driving, via the extra picture-in-picture is briliiant! My own day Driving Day with Chris was a real education and watching the DVDs are a way of ‘refreshing’ ones knowledge and serves as a great reminder of the way Chris picked out things that I didn’t, due to me not using a ‘High Visual Horizon ‘ as often as I could have done! The best DVDs that I have ever come across! This double DVD has been filmed with two professional high definition movie cameras in 16.9 widescreen and edited by a film company – Green Gecko Television Ltd. As with Ultimate Driving Craft 1 and 2 each DVD is professionally replicated from a master (not burnt) and presented in a DVD case and cellophane wrapped. During a drive through Central London the second camera was positioned facing out of the back window. During editing the image has been reversed and positioned at the top of the viewing screen and shaped like a rear view mirror. Chris drives one of his favourite Hendon routes through 5 counties with the second camera positioned to give a view over his shoulder so steering and every gear change is seen, this remains in view throughout his drive as picture-in-picture at the bottom right of the screen. So, what’s in this new dvd? Chris has been involved in driver training for 50 years during which time he has sat beside thousands of drivers ranging from learners, LGV, PCV, police and fleet drivers in the capacity of both driving instructor and driving examiner. At the MPMDS Hendon alone, he covered over a million instructional miles of high speed police advanced driver training in powerful motor cars. To this day, he is still engaged in advanced driver training via his website www.advanceddrivingtraining.co.uk which often has a waiting list for vacancies. 3. Problems caused by using the natural focal point. Many years ago Chris became aware of a problem that affects all drivers. The problem is caused by a human trait and common to all drivers. When we drive we use our eyes in subconscious mode with regards to how far we look ahead. How far we look ahead is governed by how fast we are driving, or our speed across the ground. For example, we look much further ahead when travelling at 60 MPH than we do at 30 MPH and we make this adjustment to our sight line automatically, without thinking, or even realizing it, and there lies the problem, not looking far enough ahead! Chris calls the distance ahead where our eyes settle, relative to our speed, our ‘Natural Focal point’ (not an expression you have heard much about). Driving using our ‘Natural Focal Point’ is similar to driving with ‘Eyes on Dipped Beam’. It is not the best way to drive as it can produce reactionary driving, i.e., reacting to (having suddenly situations) rather than planning or anticipating them. A running commentary helps to lift vision, without it vision drops again to the natural focal point. 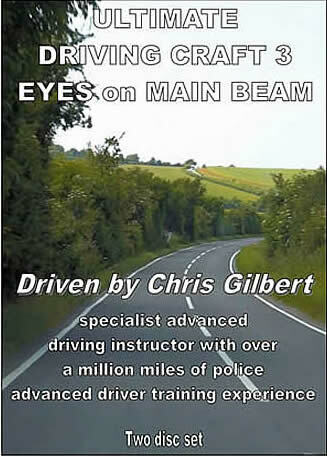 Since 1984 Chris has been using the expression ‘Eyes on Main Beam’ to promote awareness of the importance of driving with a high visual horizon, in other words, looking far beyond our ‘Natural Focal Point’. Whilst this has been mentioned in both Ultimate Driving Craft 1 and 2 there was not the time or space to expand on this issue further. With the aid of graphics, Chris will explain in detail more about the ‘Natural Focal Point’ and demonstrate to you a conscious act of how we use our eyes by looking far beyond the ‘Natural Focal Point’ and scanning. To highlight his high visual horizon and vision scans, a gunsight appears which pinpoints eye movement and exactly where Chris is looking. The result is a higher standard of driving without reaction, more time to assess, more time to act, less stress and smoother use of controls, together with far fewer application of the brakes. Another driving skill that presents difficulty is judgement of speed and distance with regards to timing and speed approaching corners and bends. Chris has frequently witnessed compression of the system and a rushed gear change. Many years ago, to help deliver this very important skill Chris drew a diagram to assist his explanation to his police advanced students, he calls it Timing of Appointments. Chris’s police students often said they would have a picture of this diagram in their ‘mind’s eye’ at the approach to every corner and bend, which helped them immensely with their timing, particularly when the approach speed was almost twice the national speed limit. This diagram proved to be a great aid and Chris still uses it to this day. Using Chris’s Timing of Appointments diagram Green Gecko Television have designed superb animation which shows each appointment stage at the approach to a bend from numerous moving angles. Chris is delighted with it as a teaching aid and we believe we will be receiving many messages from advanced driving groups seeking permission to use this footage in classroom presentations. After detailed explanation of the natural focal point and judgement of speed and distance Chris will validate the learning by driving one of his favourite Hendon training routes he still uses with his clients. You will see the highlights of a six hour drive through 5 counties: Berkshire, Buckinghamshire, Oxfordshire, Wiltshire, Gloucestershire and return. Chris will also drive a Central London Route returning via the M4 and will discuss the change of legislation regarding ‘lane hogging’ etc. As usual Chris will give a detailed and flowing instructor’s commentary centred towards the issues mentioned above and loaded with advice and tips to increase your knowledge.